Lingering issues with Apple's Internet-based services caused its company's digital storefronts and FaceTime video chat to be unavailable for some users for hours on Wednesday. As of around 3:45 p.m. Eastern Wednesday afternoon, FaceTime issues remain, with some users unable to place calls through the service. The outage has persisted since just before 1 p.m. local time. Earlier in the day, Apple's digital storefronts were down for about two and a half hours. During that period, some users may have been unable to make purchases from the App Store, iTunes Store, Mac App Store, or iBookstore. In addition, the storefront outage may have affected users attempting to download previously purchased content, use iTunes Match, or restore apps and music from an iCloud backup. 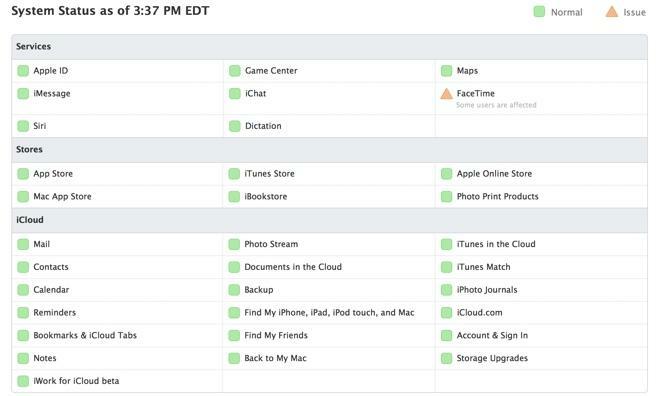 The status of Apple's various services and stores can be tracked through the company's official system status page, which gives a live overview of the availability of those products.